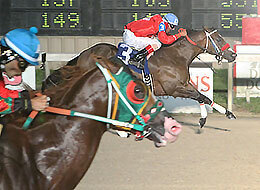 Emnent (inside) defeating Old South Futurity winner Dont Temp Me in the Firecracker Futurity(G2) trials at Delta Downs. VINTON, LA�JUNE 10, 2017�Royal Vista sires DOMINYUN and IVORY JAMES each sired a finalist to the Grade 2 Firecracker Futurity Saturday night at Delta Downs. The 10 fastest qualifiers, from 59 juveniles who participated in six trials races, will return to Delta Downs on Saturday, July 1st to vie for the winner's share of a $274,325 purse going 350 yards. Bobby D. Cox's homebred Emnent handed Old South Futurity winner Dont Temp Me his first career loss in the fifth trial (race 7). The son of DOMINYUN, who was fourth in the Harrah's Entertainment Futurity(G3) and fifth in the Old South Futurity last month, is also trained by Kennth Roberts, Sr.
Donald Watson rode the gelding to the second fastest qualifying time of :17.626 seconds, a 90-speed index. This was the Emnent's second win in five starts. He has earned $27,036. Emnent is out of the Corona Cartel mare Bodacious Dream. Capital Ice, a gelded son of IVORY JAMES from the Mr Eye Opener mare Fantastic Six, broke his maiden in the third trial for owner Jody Garcia and trainer Jose Sanchez. Ridden by Ivan Martinez, Capital Ice entered the trials off a fourth-place effort in the Grade 2 Sam Houston Futurity on April 29th. Bred in Texas by Womack/Cavender Farms, the bay has earned $42,153 in three starts. For a complete list of Firecracker Futurity finalists, their times, sires, dams, owners, breeders, trainers and jockeys CLICK HERE.